Electricity is one of the inevitable sources of energy in the world. We produce engineers to enhance and establish it in a smart way. 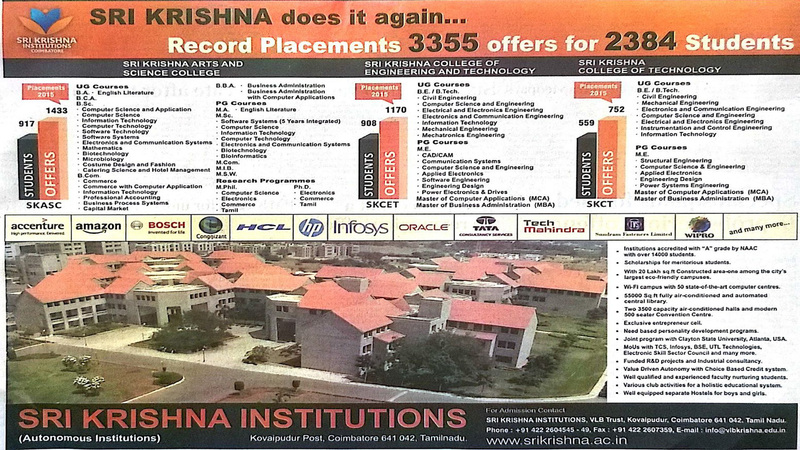 We offer one undergraduate programme of 4 years duration and one post graduate programme of 2 years duration. We totally have 43 faculty members who are knowledgeable and enthusiastic, imparting their skills and technical knowledge over 750 students who are pursuing their Undergraduate and Post graduate courses in our department. We have well equipped laboratories with good infrastructure which has ten lakhs worth equipment's and components in 6 core and 2 computer laboratories. The department has a library which contains over 511 books in different streams of EEE. 1. Equip the students with adequate knowledge in the field of Electrical and Electronics Engineering and professional skills necessary to face the future challenges with confidence and courage. 2. Engineer them to engage in research activities leading to innovative applications of technology for the benefit of mankind. 3. Enable them to become responsible citizens of the country with a willingness to serve the society. To provide high quality technical education to equip the students with the innovations and developments in the field of Electrical and Electronics Engineering, enabling them to become employable, successful and responsible citizens of the country. PEO1 To prepare students for successful careers in industry that meet the needs of Indian and multinational companies. PEO2 To develop the ability among students to synthesize data and technical concepts for application to product design and to solve research problems. PEO4 To provide students with a sound foundation in the mathematical, scientific and engineering fundamentals necessary to formulate, solve and analyze engineering problems and to prepare them with entrepreneurial attitudes and for graduate studies. PEO5 To promote student awareness of the life-long learning and to introduce them to professional ethics and codes of professional practice. PO-A An ability to apply knowledge of mathematics, science and engineering. PO-B An ability to design and conduct experiments, as well as to analyze and interpret data. PO-C An ability to design a system, component, or process to meet desired needs within realistic constraints such as economic, environmental, social, political, ethical, health and safety, manufacturability and sustainability. PO-D An ability to function on multidisciplinary teams. PO-E An ability to identify, formulates, and solve engineering problems. PO-F An understanding of professional and ethical responsibility. PO-G An ability to communicate effectively. PO-H The broad education necessary to understand the impact of engineering solutions in a global, economic, environmental, and societal context. PO-I A recognition of the need for and an ability to engage in life-long learning. PO-J A knowledge of contemporary issues. PO-K An ability to use the techniques, skills, and modern engineering tools necessary for engineering practice. PO-K Graduates will demonstrate an ability to design digital and analog systems and component. 1. AC MACHINES LABORATORY AC machines laboratory is well equipped with AC and in efficient working condition. The aim of the laboratory is to provide wide practical knowledge on the working principles and the applications of electrical machines. 2. DC MACHINES LABORATORY DC machines laboratory is well resourced with DC and in efficient working condition. Aim of the laboratory is to provide a wide practical knowledge on the working principles and the applications of electrical machines. 3. ELECTRIC DRIVES AND CONTROL LABORATORY Electrical Drives and control laboratory has been established in the year 2015. Lab is spanning about 89 square feet. 4. ENGINEERING PRACTICE LABORATORY Engineering Practice Laboratory is furnished with wiring components, Energy measuring instrument, Megger with Power measuring technique, Waveform measuring instruments, Basic gates, PCB Design and Soldering Methodology. 5. POWER ELECTRONICS LABORATORY The laboratory facilities provide practical exposure in the field of analog and digital electronics which motivates the students to apply their technical knowledge in real time applications. The lab intends the students to acquire knowledge from the basics to advanced level of electronics. 6. CONTROL AND INSTRUMENTATIONS LAB Aim of this Laboratory is to reinforce the students with adequate work experience in the field of control engineering and instrumentation of different quantities and also the expertise in handling the instruments involved in Electrical and Electronics Engineering. The laboratory is outfitted with advanced equipments with efficient user interface. 7. ELECTRONICS LABORATORY The laboratory facilities provide practical exposure in the field of analog and digital electronics which motivates the students to apply their technical knowledge in real time applications. The lab intends to enable students to acquire knowledge from the basics to advanced level of electronics. 8. POWER SYSTEM SIMULATION LABORATORY Lab is provisioned with computers where the students are exposed to work on electrical related software like MATLAB and PSCAD. This lab is furnished with sufficient computers with necessary facilities. Rather than solving power system related problems, this lab is highly beneficial for the students to get introduced to work on electrical software which would be extending a helping hand during their final project phase. 9. RESEARCH LABORATORY The Department has been a pioneer in the field of Electrical and Electronics Engineering, with core Research and Development in Power Apparatus and Systems for many decades. The department’s vision is to excel in various research areas of Electrical Engineering so that it can contribute to the progress of the nation. The lab facilities and the infrastructure are regularly upgraded and are well supported by the institute and the industry. The research at the department aims to take projects to meet the needs of the society. The department's research efforts are improved by collaborations with leading research universities and industries around the world. The students are encouraged to make a comprehensive use of the research lab. SoM, SKCET admits students on the basis of TANCET and CET scores. Since the college attracts top ranked students in these entrance examinations, the students’ overall performance is remarkably well. Being an autonomous institution, SoM enjoys extra leverage to continuously fine-tune its curriculum to suit the industry requirements. The subjects being taught are a blend of Management theory & practice which stands the students in good stead to face the challenges posed by the industry. Each stream offers 10 elective courses covering all aspects of the stream. The students have the flexibility to choose eight elective courses from any of the above elective streams. A team of highly qualified and experienced faculty is the biggest strength of SoM, SKCET. 80 % of faculty members hold Doctoral degree in Management and they have an average of 15 + years of teaching and industrial experience. SoM, SKCET is one of the authorized research centre of Anna University, for carrying out Doctoral Research. SoM, SKCET secured 41st place among the top B-Schools in India from the National Institutional Ranking Framework (NIRF) – 2016 of MHRD, Govt. of India.